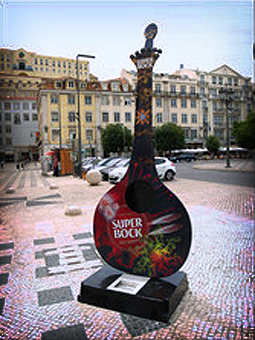 In 2009, Super Bock, Portugal's biggest brewery, challenged designers to decorate 5 guitars (3m tall) that were going to be placed in Lisbon downtown during the summer months. The prupose was to to participate in St. Anthony (Lisbon most popular saint) festivities, in June, and many entered the competition. My work was one of the five winners, in Portuguese guitar(Fado) competition. Of the total five, this and another one were donated to Museu do Fado (Fado Museum), in Lisbon. In 2009, Super Bock, Portugal's biggest brewery, challenged designers to decorate 5 guitars (3m tall) that were going to be placed in Lisbon downtown during the summer months. The prupose was to to participate in St. Anthony (Lisbon most popular saint) festivities, in June, and many entered the competition. My work was one of the five winners, in Portuguese guitar (Fado) competition. Of the total five winners, this and another one were donated to Museu do Fado (Fado Museum), in Lisbon. Final work exposed in Rossio, in Lisbon downtown.